Having jacked our cottage off the ground (in association with a qualified house lifter) we elevated ceiling height before dividing the new basement space into seven neat zones, two of which (a guest bathroom and a laundry) we revealed last week and three more of which we're showcasing today. Finishing your basement? Here's what you need to know: Colin and Justin raise the game (literally) at their formerly run down lakeside cottage. Zoning. A keyword which describes our primary tactic as we set about planning the living space at our most recent lakeside project. 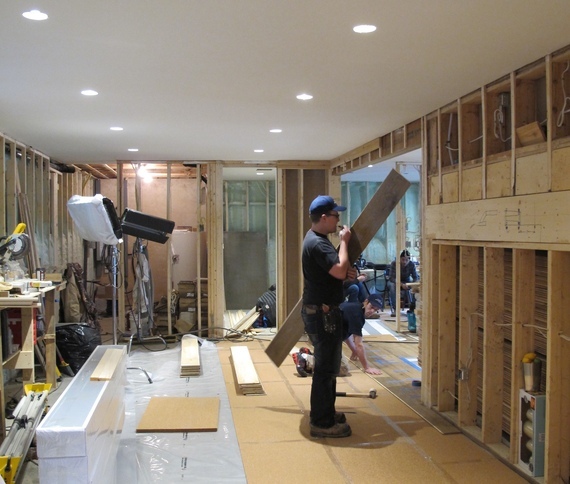 Having jacked our cottage off the ground (in association with a qualified house lifter) we elevated ceiling height before dividing the new basement space into seven neat zones, two of which (a guest bathroom and a laundry) we revealed last week and three more of which we're showcasing today. 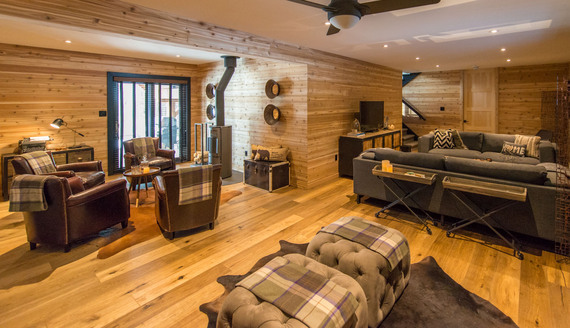 Cue our TV crash zone, a music station suffused with a little "days gone by," and a relaxed whisky bar where guests can gather -- in leather chairs around a contemporary fireplace -- without a care in the world. First up -- we clad the entire basement in Western Red Cedar, a lumber genus we've grown to love as our affection for cottage country grows. Visit http://www.realcedar.com for more info about the wood variant. Arranged across every wall, it makes a huge statement. There's no denying it looks inviting (and really 'speaks' to cottage mood of old) but its olfactory quotient is equally wonderful. Even months after completion, it's every bit as seductive as the day it was installed. The smell, in fact, is one of the first thing people notice (even before venturing downstairs) when they arrive. Appraising the wood genus, it's clear we made the best decision: for us and the environment. Western Red Cedar is a sustainable timber whose forests are systematically and conscientiously replenished as time endures. Considered the Cadillac of lumber by woodworkers, carpenters and contractors the world over, it's substantially less troubled by degradation and decay than many other wood varieties making it ideal for application both indoors and out. 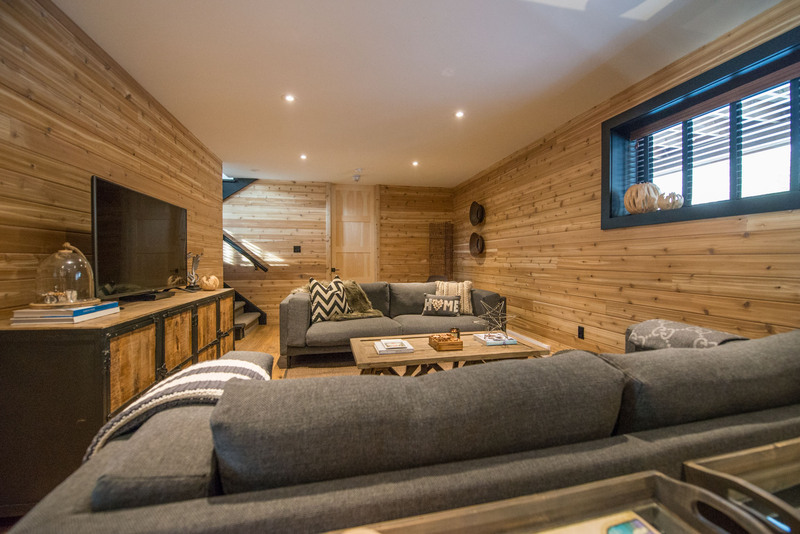 What's more, as time endures, Western Red Cedar takes on the most captivating "silvering," effectively colour balancing when played against other finishes such as wood, stone, concrete and paint or pretty much any finish, for that matter, with which it's paired. Having specified the same genus to build our decks and docks during many projects, we've saved a fortune on maintenance having opted NOT to stain or varnish. Hey presto -- fewer labour costs, post install, and no need to re colour or re varnish as each year rolls forward. Come on: who doesn't want to reduce maintenance and minimize effort, going forward? Underfoot, throughout, is engineered Kentwood Couture from Metropolitan Flooring (http://metrofloors.com/home) a specification which reacts well to temperature shifts or moisture ingress -- important factors to consider when flooring any lower level. Installed by the team at Taylor Carpet One Huntsville http://www.taylorcarpetonehuntsville.com, it's warm underfoot and a perfect compliment to the basement's cedar walls. Being that the downstairs area is L shaped (the "missing" space is taken up by a six-feet high ceilinged storage area under the upstairs "sunken" living zone) it was easy to carve into distinct zones. 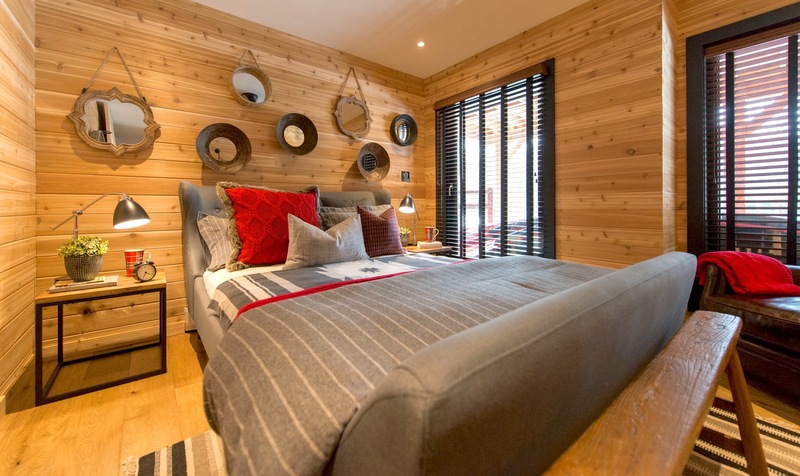 At one end sits a bedroom (again wood clad) which we dressed with a grey sleigh bed and further detailed with graphite toned linens and faux fur. Arranged as a statement on the principal wall is a quirky assortment of mirrors which helps bounce light around the room. To further brighten, we installed large windows to take advantage of the lake view and, dressed out with timber effect blinds, the atmosphere is at once warm and inviting. Short on space for an actual wardrobe, we installed a wire clothes rack and a selection of hook to amply accommodate guest requirements. In the living zone next door, a large flat screen TV floats on top of an outsized credenza with bags of space below for CDs, DVDs and board games -- important considerations when the weather closes in and indoor R&R takes precedent over lake time and forest walks. Two large sofas (mindful of budget we sourced these from Ikea) provide bags of space to kick back, while a chunky table provides a solid surface for coffee cups, beer mugs and wine glasses. Above this area is positioned a long, skinny window -- again detailed with a wood look Venetian -- and this aperture more than illuminates the area by day, negating the need to switch on electric light. Sure, this is technically the basement, but most walls are above ground so positioning windows was never going to be an issue. Beside our TV station is the cabin's music zone. There's a modern CD player cached in the drawers (and of course the house is wired for sound) but we opted to go 'old school' in so far as what could be seen. In that regard, we visited the local thrift store where we rooted out a turntable, speakers and an amplifier for the princely sum of $120. Hipsters? Us? How very dare you. All retro jewels are in perfect working order and are proving a hit with everyone who has visited. Who (of a particular age, certainly) isn't seduced by a little retrospective allusion? To complete the picture we stuffed the drawers full of vintage vinyl with categories to suit all demographics. Detail, right? The final zone is an area we call Plan B's "Whisky Bar." Attired as before in Cedar, we added a drop dead gorgeous log burning fire (http://www.stuvamerica.com) and a gaggle of comfy, brown leather tub chairs. In a storage trunk (found for $15 in Kensington Market) awaits a collection of Scottish spirits from which our friends and family can select their favourite tipples with only one instruction from us -- "enjoy!" 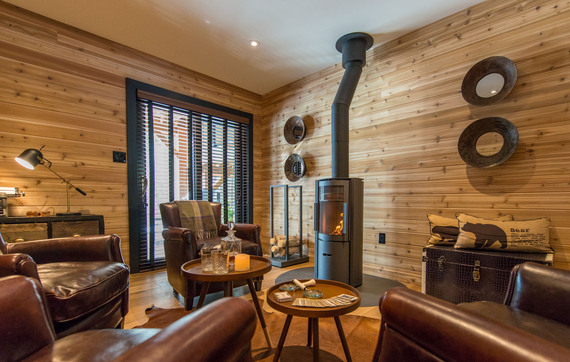 The resultant nook is the perfect place in which to end the day either in winter (with the flames twinkling) or in summer in front of the bug screened walkout that leads to a barbecue patio and onwards (via manicured grounds) to the lake. Bliss, or what? Next week, in these virtual pages, we'll be heading outdoors to showcase our metal roofed modernist square cut log cabin bunkie, a wonderful two bedroom guest annex which, complete, feels like floating through a 1980's Roots TV commercial. Expect mountains of red plaid, acres of chunky linens and more Canadiana than The Hockey Hall Of Fame! 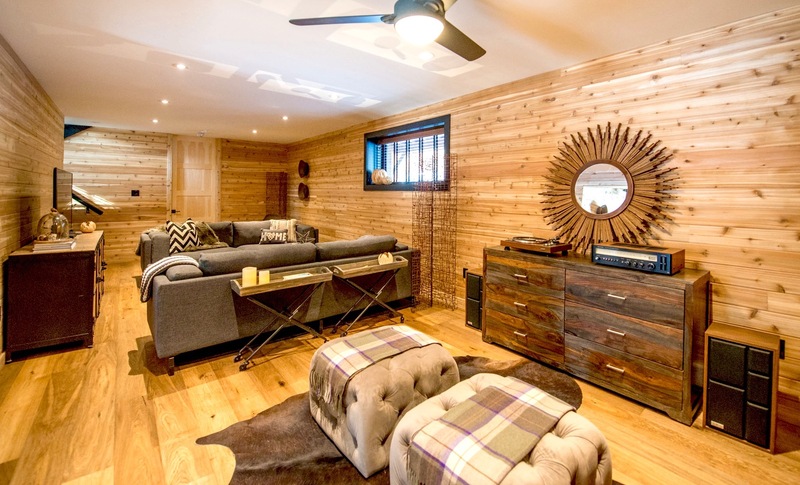 Cabin Pressure airs on Cottage Life, Sundays, at 9 p.m.
Colin and Justin are resident judges on Game of Homes -- W Network, Tuesdays at 10 p.m.